In July, Cambridge MP Julian Huppert asked a great air quality PMQ, referencing research on the increased risk of heart failure from air pollution. 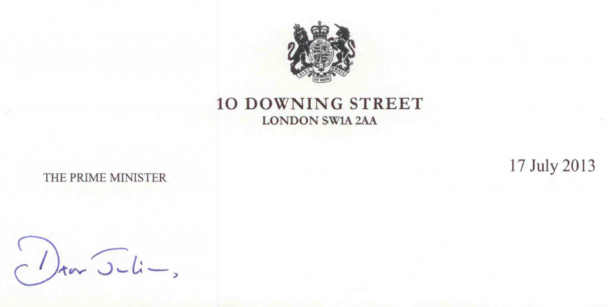 Although disappointed with the drab reply, we were at least reassured to know that David Cameron intended to follow this up with a written response. As promised, we’ve published the letter below. More of the same unfortunately. Vague and non-committal, it doesn’t really merit much discussion. It underlines the government’s passive approach to an issue which causes 29,000 premature deaths each year, and which among other things increases the risk of heart failure and reduces the lung capacity of children. 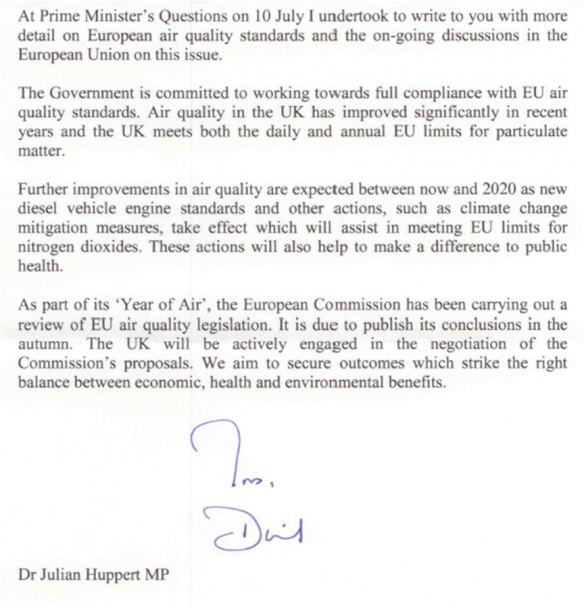 David Cameron’s final sentence assures Julian that “we aim to secure outcomes which strike the right balance between economic, health and environmental benefits.” Aside from the broader question as to whether it is morally or legally justifiable to let people suffer because you refuse to prioritise action to meet legal limits, the Healthy Air Campaign wonders how the Prime Minister can miss the fact that when health suffers to this degree, so does the economy. A proactive approach to addressing air quality would boost the green economy and pay dividends in terms of a healthier population. “If you think the economy is more important than the environment, try holding your breath while counting your money,” he said. Despite a particularly short sighted response from David Cameron we are nonetheless pleased by Julian Huppert’s support for the issue and will be following up with him next week. As a scientist and cyclist it’s no wonder he seems to understand that we are nowhere near achieving the ‘right balance’. Read the latest Healthy Air Campaign news here. Find out what you can do to tackle air pollution in your area here.